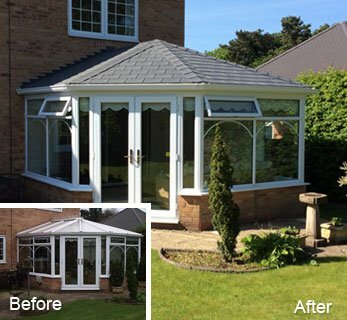 Transform your conservatory with a Warm Tiled Conservatory Roof from Abbey & Burton Glass. 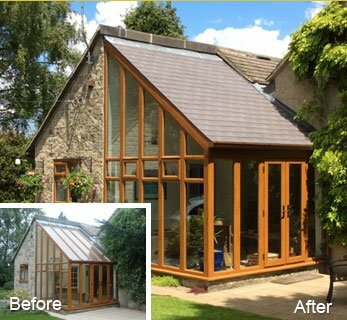 These light weight aluminium insulated roofs transform your conservatory into an all year round living space, making the room warmer, cooler and quieter. We ensure easy installation and have extensive experience in this type of work. This type of roof is an ideal replacement for all types of glass or polycarbonate roofs just contact us today if you have any questions about your current situation. For help or advice on our Warm Tiled Conservatory Roof Replacements please call 01332 371883 or fill out the contact form below and we will be in touch as soon as possible. Once again Abbey & Burton Glass has provided us with an excellent service and we should like to pass on our thanks to your team. Over the years we have upgraded our home with a variety of new windows, doors and conservatory and have always been delighted with the end result. 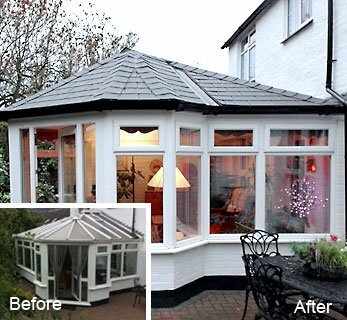 In respect of the recently installed tiled roof for our conservatory we should particular like to praise the installation team who worked diligently throughout some fairly wet conditions. These guys are a credit to your company. Thank you for providing the complete service - friendly sales, fantastic installation teams and efficient and prompt after sales. I am very pleased with the Conservatory. The standard of workmanship is excellent and all the workman were an asset to your company. I would have no hesitation in recommending your products.